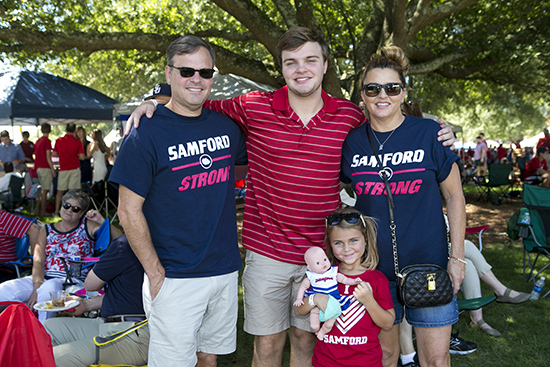 Thousands of parents and other family members descended on the Samford University campus last weekend for another successful Family Weekend. A total of 822 families, representing thousands of individuals, from 32 states and one foreign country preregistered for the weekend. One such memory involves the families of junior biology major Bryan Bashrum from Frisco, Texas, and sophomore prebusiness major Callan Kriedel from Franklin, Tennessee. In 2006, the Bashrum and Kriedel families both adopted boys from an orphanage in Kashin, Russia. This weekend, during a Parent Leadership Council meeting, the two families made the connection that their boys came from the same orphanage. “At Samford, everyone is one big happy family,” said Donna Bashrum. Samford held a variety of events that ran from Friday until Sunday, including scavenger hunts, concerts, tailgates, tours and open houses. The Parents Academy was new this year, offering parents an opportunity to take classes taught by Samford faculty members. There were two sessions offered on Friday with a total of 12 classes representing all areas of undergraduate study at Samford. Dave and Joan Kanne of Dallas, Texas, attended a film studies class taught by Geoffrey Wright, associate professor of English and coordinator of the film studies concentration. The Kannes’ daughter, Allison, a senior journalism and mass communication major, is taking a film and religion class co-taught by Wright this semester. Wright lectured on the famed film Citizen Kane to a classroom of 15 parents. He discussed how viewers can read a film using certain film studies techniques, including framing, mise-en-scené and editing. The hour-long class included clips from the film, with commentary by Wright and a discussion among the parents regarding the film. A Tiny Sam Photo Scavenger Hunt on Friday was won by Clay Pennington, of Richardson, Texas, father of senior English major Chelsea Pennington. The Penningtons were recognized at the football game on Saturday, and will receive a Step Sing Weekend Package of four Step Sing tickets, a two-night stay at the Courtyard by Marriot in Homewood and dinner at four restaurants of their choosing. Friday also included a carillon concert performed by Samford’s resident carillonneur Stephen Brooks Knight, a welcome reception hosted by Samford President and Mrs. Andrew Westmoreland, tours of the new Cooney Hall, and a showing of the film Homeward Bound on the University Quad. Saturday began with a parents prayer walk around the Quad and the Samford Parents Association annual breakfast meeting. Throughout the morning, there were open houses for the Brock School of Business, the Orlean Bullard Beeson School of Education and the university’s various fraternities and sororities. Before the men’s football team took on the University of Tennessee at Chattanooga, thousands gathered for tailgating on the Quad, with 42 tents representing organizations from all around campus, including schools and departments, and parent and alumni groups. Samford’s Air Force ROTC detachment hosted a Paper Airplane Contest on the Quad alongside the tailgate, where students and their families could compete for a $500 scholarship credit to be added to the student’s account. Freshman prebusiness major Carson Cupo of Leeds, Alabama, won the scholarship, making a plane that flew further than any other. The weekend concluded with Samford’s annual community hymn sing, which drew a capacity audience to Reid Chapel. “That families from 32 states and at least one foreign country would go to the time and expense it took to spend the weekend on campus speaks volumes as to how much the Samford community loves this place and every opportunity to gather,” Doyle added. Emily Duval and Jimmy Lichtenwalter are journalism and mass communication majors and news and feature writers in the Office of Marketing and Communication.